Brixton Station road is slowly becoming another food court. There’s a stall or two most days but there’s the widest choice during the day on Fridays and Saturdays. You can never tell what will be there as they move around. So when we were out shopping and fancied something different we came upon this pitch towards the Brixton Road end with an Italian offering. 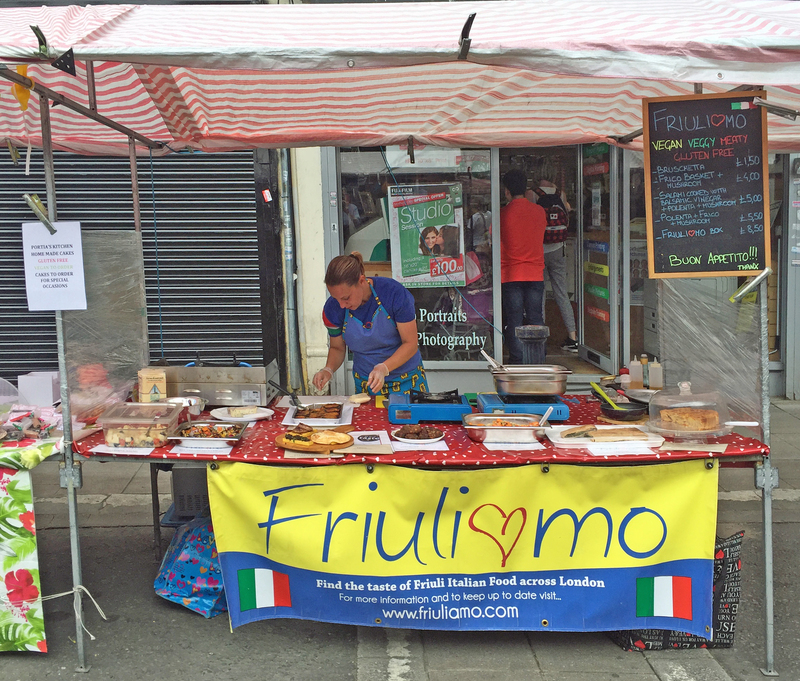 The website describes what is served as “Friulian Street Food” with the strapline is “For the love of polenta and frico”. The chef is Italian from Friuli, which is in the north east where polenta is the staple. Italian food is usually heavy with cheese or with meat with lots of soft pasta or all on a pizza, so it is a revelation that you can have vegetarian, vegan and gluten free – sometimes in the same dish. The polenta comes in slices which is then grilled with toppings of mushrooms and individual fried aubergines in a batter. Polenta can sometimes seem boring but this was soft and moreish, even when heated up. We were offered some mint sauce and that did make it all the more interesting. This is one of the newer bar/cafés to open in Brixton and is probably the bravest, as it is in one of the arches planned for closure and rehabilitation by Network Rail. It describes itself as having “an intimate 1920’s speakeasy setting” and is aimed mainly at the evening crowd. But we went to have brunch late one Sunday morning, when is more in the café mode. Although not mentioned on its website, this runs from Thursday to Sunday from about 11.30am to 5.00pm. 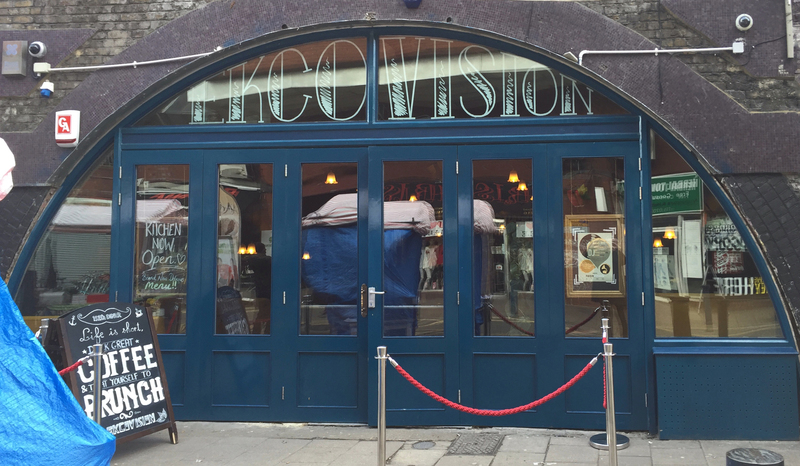 You can eat anywhere in Ekcovision – there a tables and chairs; booths with bench seats; and, for those who want a quiet time, the upstairs “Den” is really out of the way. We sat downstairs, next to the door onto Brixton Station Road. Unfortunately the doors never closed properly and were after left ajar. 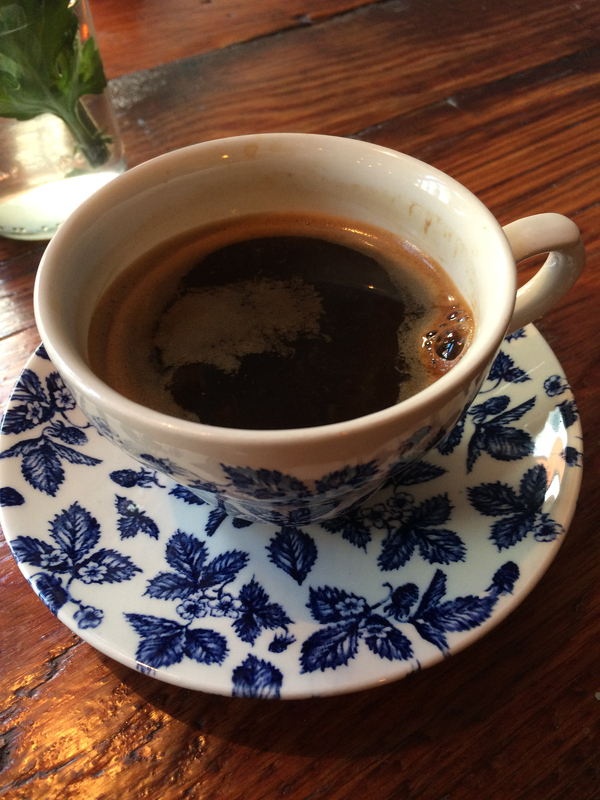 But, given that it was a cold morning, this helped in a way as it created a community with other brunchers, as we all took turns to close them. They have a short menu of pastries (croissants and the like), a full meat or veggie breakfast, soup of the day and various styles for poached eggs (Benedict, Florentine, etc.). 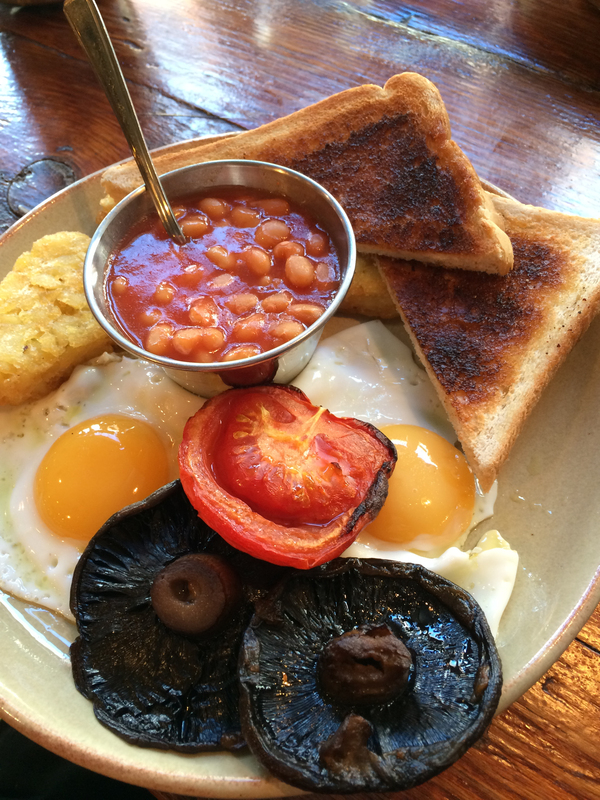 We chose a veggie breakfast and an eggs Florentine, washed down with an Americano and pot of English Breakfast tea. It was all very relaxing and we didn’t have to wait long until all the dishes and drinks arrived, although then my dish had to be returned as it was the Benedict not the Florentine. The veggie breakfast was straight-forward, with the potatoes bought-in, most-likely frozen. But the eggs were fresh and it was tasty and filling. I assumed that they would just re-plate the poached eggs for my mistaken dish but they actually cooked a new batch. This took a little longer but we were in no hurry and when they arrived they were still piping hot but not overcooked. You can’t say much about an English muffin, so I won’t, but the Hollandaise sauce was great. I suspect that it probably wasn’t really “Homemade”, as described on the menu, but it did have lots of lemon and, when served, the dish had been seasoned with black pepper. So there is attention to detail. The whole bill was £18.50 for the two of us. We couldn’t fault it and we would probably return.